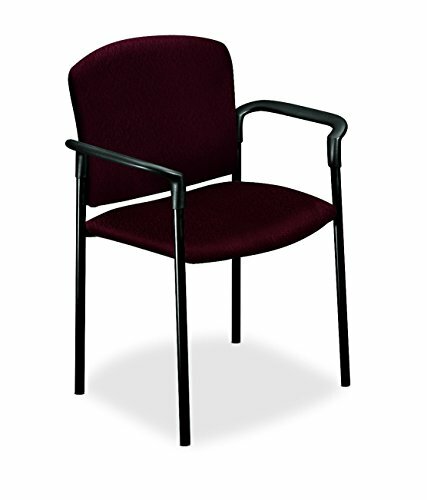 Stacking guest chairs stack up to five high for use in meeting rooms, conference areas, cafeterias and reception areas. Molded seat under pans protect seat fabric when stacked and give a finished appearance. 20-1/4" wide x 19-3/4" deep seat is made with a compound-curved, blow-molded plastic and a 3" thick urethane foam cushion. Usable seat depth is 16-3/4". Seat from floor height is 18". Inverted U construction with 1" 14-gauge steel tubing runs through polymer arm caps for exceptional rigidity. Guest chairs have fully upholstered fan backs that measure 21-1/4" wide and 16-1/4" high. Polymer arm caps have gently sloping, wide top surfaces for maximum comfort. Upholstery is made with 50 percent polyester and 50 percent acrylic fabric with fabric protector. Chair is available in black frame only. Certified by SCS to be in compliance with specific indoor air quality emission requirements. Meets or exceeds applicable ANSI/BIFMA standards.